Ambrosia is unfairly lumped with wimpy 70's bands because of a few Doobie Brothers-ish commercial hits on their later albums -- "How Much I Feel," "Biggest Part Of Me" and "You're The Only Woman." But if you heard the rest of the albums they came from, you'd be hard-pressed to call them creampuffs. When I first landed in Buffalo to start my freshman year in college, this was the first album I had to buy at the school's record co-op. I had heard this magical song "Nice Nice Very Nice" on then -progressive radio FM station WNEW a few times over the summer and it knocked me out. 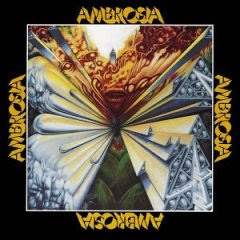 Ambrosia's album was as spaced-out as the cover, drawing from many musical sources: progressive rock, jazz, R&B, and film music, sort of a more commercial, next generation version of King Crimson. When I say "prog rock in the case of Ambrosia," I don't mean Yes or Emerson, Lake, & Palmer, but a blend of numerous styles of music and eclectic instrumentation, with a literary twist. "Mama Frog" paused halfway for a recital of Lewis Carroll's "Jabberwocky." A clock tower rang in time with the bass and jazz guitar to start "Time Waits for No One," which breaks into a flat-out flamenco dance with handclaps as it hurtled towards its climax. A harpsichord plays an Irish jig in "Make Us All Aware." All four band members were multi-instrumentalists who each could sing powerful leads and harmonies. This was a "headphone album" in every sense of the phrase. And it should be no surprise that it was engineered by Mr. "Dark Side of the Moon" himself, Alan Parsons. "Nice Nice Very Nice" was the perfect curtain-raiser for Ambrosia, because of its trademark elaborate arrangement of electric instruments, drums, bassoon, trumpets, and synthesizers. The verses were lovely major/minor patterns, building up to the chorus which the group echoed and layered in beautiful harmonies. Or the lion hunter in the jungle dark. They all fit together in the same machine. Yes, we all are partners in this cosmic dance. 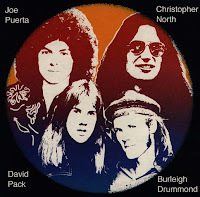 David Pack, who would go on to co-write songs with James Ingram, sing on David Benoit tunes, produce a Patti Austin record, eventually leave Ambrosia and find Jesus, truly had one of the most distinctive voices in rock music and unfortunately, probably never heard enough. He had a theatrical take on the lyrics, creating an effected accent for "a Ginger Rogers and a Fred Astaire," coarsening his voice for "teenage ROCK-er," then softening for the soft "a" in "France." The song's ending is a huge shift, softening down and then a ethereal acoustic guitar comes out of nowhere strumming the final four chords, slowing while a synthesizer note jumps a few octaves to hit the final high tone in time with the guitar. I could find not videos of "Nice Nice Very Nice," but I did find a site that streams the whole song in high quality Quicktime. By all means, click on the link below and listen to it in a quiet place. Yeah the debut album by Ambrosia is truly brilliant! It is America's answer to the English prog rock bands.The songs Nice Nice Very Nice, Time Waits For No One, Make Us All Aware, Mama Frog, and Drink Of Water are all Classic Prog Rock songs. Ambrosia's first album is one of the greatest debuts ever!!! Check out these new Killer Live versions of some of Ambrosia's Classic songs! performance on the Drum Channel are now out on youtube. Joe Puerta and David Pack share lead vocals on this. with his excellent rolling r's.